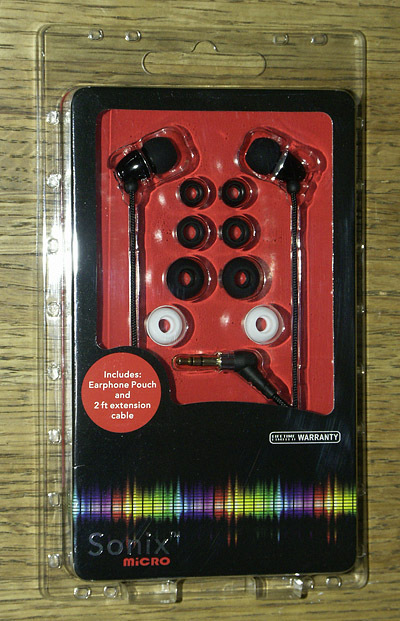 In an earlier post, Cans, I ran through my latest collection of earphones and earbuds and reminisced a bit about some older sets I have owned. 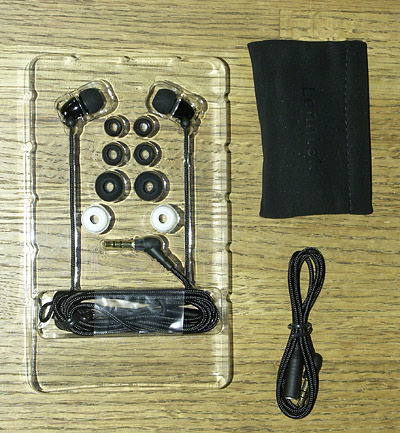 This time I want to run-on at length about a new set of earphones I bought, technically inner-ear buds, from Lenntek- the Sonix Micro. Without getting into sub-micro political details and online squabbles about what they were copied from or where they come from, I would just like to say that they sound wonderful. That’s all that matters to me for an under $40.00 set of ear buds. COSTCO online has been running a half-off deal on these ear buds for months now, making the selling price $19.99. I bought one pair of them back in about August of ’09 for that price and thought that even if they sucked it wouldn’t be a great loss. After living with them for six months I decided to order a second pair as a back-up because I liked them so much. To the side of the plastic tray is an included extension cord (a 2 foot long male to female micro extension) and a carry bag. They are 4.5 feet long from the tip of micro plug to the ear buds. The sound- I was surprised on first listen at how much bass they seemed to have. At first it bothered me a little that they sounded bass heavy. After listening to them for six months I greatly appreciate their overall bass emphasis. Normally I’m someone who thinks that all earphones should be ruler flat in frequency response to transmit what the musicians and sound engineers intended the music to sound like in the first place. BUT…these Sonix Micro earbuds are really intended for use with an MP3 player or cell phone or laptop and they sound much better, to my ears, over time by having that bass emphasis there. I have a set of Ultimate Ears SuperFi 3 ear buds that have little bass emphasis, in fact by comparison have a bass cut, and too much high-end emphasis and they become fatiguing to listen to for long periods to me. I likey the bass on the Sonix Micro. 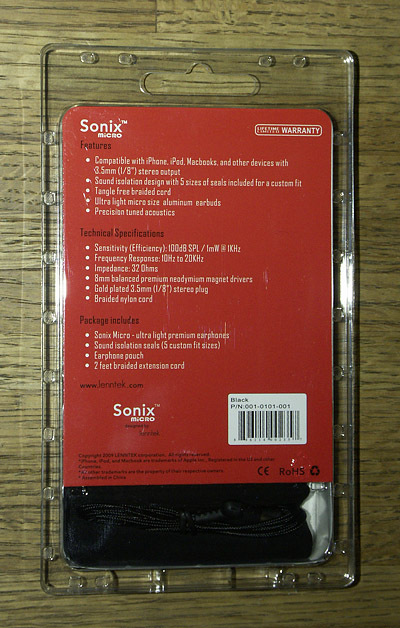 The Sonix Micro instruction sheet that comes with the ear buds instructs you to make sure that you get a good seal in your ear with the supplied five different sized sets of ear tips in order to maximize their sound. They’re not lying- it’s essential to them sounding good. Depending on the shape of your ear canals (my left ear is a weird shape and I have constant trouble getting the seal, and therefore balance and frequencies, correct) it makes a huge amount of difference as to how they sound. The Sonix Micro earbuds sound detailed without “hearing” everything, which usually just means flaws, like digital artifacts and hiss. They smear the sound a little, but with small MP3 players this is generally a good thing. The imaging is truly wonderful, if you have them sealed correctly in your ear. They put the music right into your head, between your ears, with hardly even noticing it. 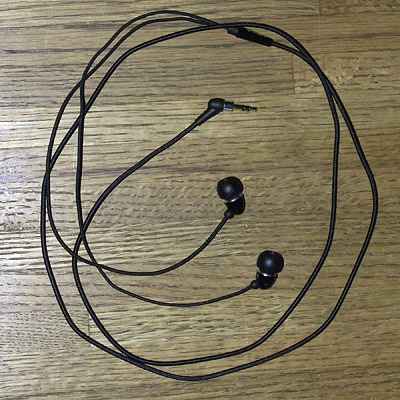 These things feel invisible after just a few minutes to the point that you completely forget that you even have ear buds in there. Two points that don’t effect me and the way I listen to these ear buds (which is just sitting, or laying, there quietly)- I’ve read online criticisms about the fact that people who are moving around (exercising, walking, etc.) claim that they transmit sound through the cable to the ear. Also, they have a nylon wound braid on the cable, which is supposed to cut down on the cable tangling because of less surface stickiness. Truthfully, I don’t think that it helps much more than being made out of rubber; the cable still tends to knot and tangle as much as rubber. It’s the perverse nature of those damned cables! Bottom line: They work well, sound wonderful, and haven’t given me anything but pleasure so far. I can’t say that about many things these days. As I said, I even bought a second pair to have if something happens to the originals and they sounded exactly the same as the first pair. What more can you ask from a twenty buck pair of ear buds???? These are the ear buds that Apple SHOULD have put in the box with their iPods and iPod Touches, instead of the crappy ones they do. Disclaimer: I have nothing whatsoever to do with COSTCO, Lenntek, or Apple. Buy these little beauties wherever you can. I hope you have as good of luck as I have had with them.